What is it? An Elf, a Dwarf, a Barbarian and a Mage all walk into a Mall and everyone can already see this group is the start of a bad joke. After being fleeced of armaments, wealth and dignity our band of sad adventures add the flavour of tears to the putrid swill they drown their sorrows in at the Food Court of the Magic Maze Mall. Whilst down and almost out, chatter begins over glorious gear they spotted drudging their feet through the malls corridors and in the vein of heroes before them, they vow to... steal them? It's a plan, not a smart one, and with urgency before they are dragged any lower in life status, our group must loot and run! You’ll start in a central location (think food court after lunch) and by moving pawns through the mall, you’ll explore by flipping over tiles from a randomised mall space deck and spiraling out a map of commercial property. You’ll use designated class portals to teleport party members between the mall spaces, you’ll ride escalators or simply hoof it by foot as you explore the mall, but only through mutual understanding of the parties best paths and movement will you come out on top. This is because each player at the table only has unique card/s showing which actions they are able to make and players cannot communicate verbally or non verbally throughout the majority of the game. 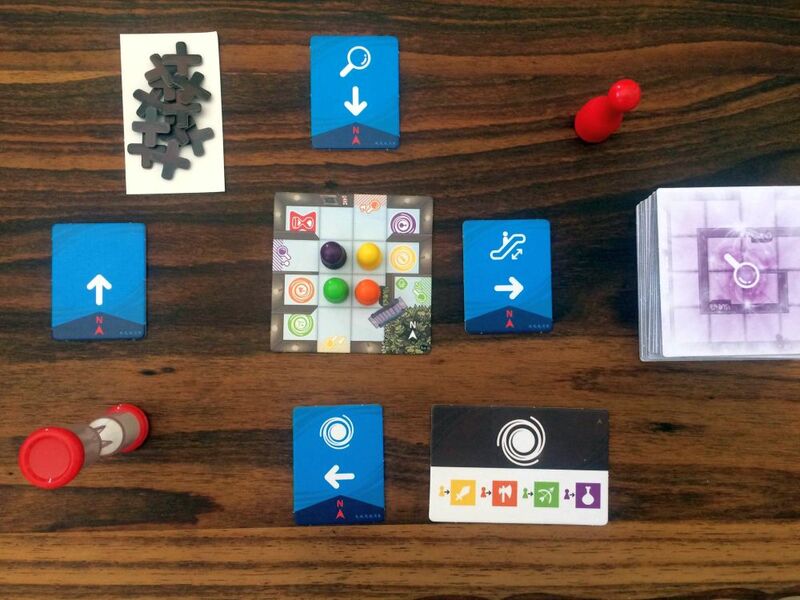 For example, in a four player game, each player will only have one movement direction that they can move any of the pawns in and 3 of the 4 players will have an additional special action: using the escalator, laying new mall tiles when pawns are at an exploration port, or using the portals to teleport. All players move pawns simultaneously and in real time so everyone needs to watch all the pawns as they explore the mall for when they need to move characters in the relevant directions, or to activate special abilities. See an action on the board that needs to be done by a specific player, and you’ll need to bang down the big red attention pawn in front of them to indicate you’ve seen something that requires their attention and hope they notice it too. At the start of the game, players will be able to strategise verbally how pawns need to move around in the first room. Exploration spaces at the edges of each tile are labelled with a specific class, meaning only that pawn can perform the explore action and draw another mall tile to link to that exploration space. Plans are made to get each of the coloured pawns to their respective explore space, then the 3 minute sand timer is flipped and players frantically start performing their necessary actions and the madness begins. As you start flipping out extra tiles, you’ll realise that the tile the barbarian explored to move into has no barabarian (yellow) explore spaces on it, meaning that him moving into that area of the mall is futile. His talents are actually needed west instead of south… but you don’t have the actions that can move him in that direction AND you cant talk. You’ll grab the attention pawn and start banging in front of the player who can move things north… but they are focused on moving another character pawn north. 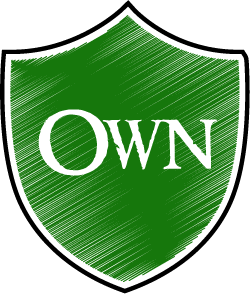 At the same time someone else grabs that attention pawn and bangs it down in front of you, forcing you to change your focus to what they need you to perform. Moves flow as you explore and slam pawns for assistance and as you’re exploring, you realise three minutes just aren’t enough, so you’ll need to get a character pawn onto an hourglass space, allowing you to flip over the sandtimer and provide you with a moment to strategise by talking. As soon as any player performs a move action, communication is barred as you frantically continue to find the loot and get out of the mall. Run out of time, you lose. Steal the goods and escape, you win. But this game is anything but simple. 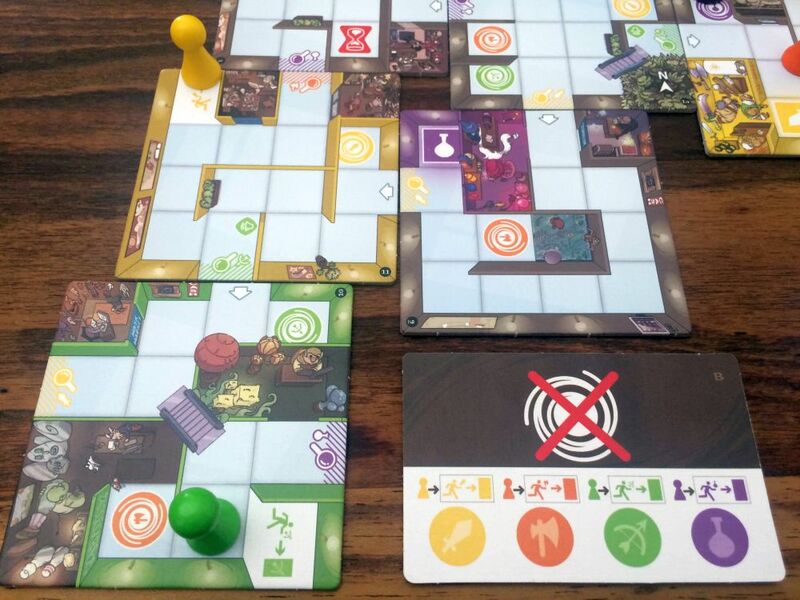 While similarities can be drawn to Escape: Curse of the Temple, Magic Maze is a much more skill-based and cooperative game. Magic maze reduces luck elements to the draw pile and while this can influence the game, skilled players will have enough time to make their way through the mall to find and secure their objectives. Magic maze is also scenario based, with subtle changes to the rules for each of the 17 scenarios included in the core box. Initially all class pawns will leave through the same exit, then you’ll need to discover a unique exit for each colour pawn. Initially you’ll be able to focus on your given action for the whole round, but later each time you reset the hour glass, you’ll need to pass your ability to the left forcing players to adapt to the new actions. Different classes later gain different abilities to help you and the Magic Maze mall continues to grow, with the stack gets larger and larger each round. Its a fantastic way to add complexity to a game of this type and you’ll keep evolving as a player. I love the puzzle of this game. There are moments where the group think becomes a well oiled machine with each player barely puasing before making optimal moves and the hive mechanisms make short work of exploration. And then moments of Chaos were the attention pawn is being banged constantly, frustration is evident as players fail to move optimally for each other and where you miss getting additional time by a few grains of sand. Each scenario adds just that little bit extra, and failure doesn’t mean doing identical routes again as complexity remains while the random draw brings about that variation to keep the challenge interesting. You’ll fail often, but each time your group plays in a single setting, they’ll notice each others play patterns, thoughts on how to get things done and what they need to all focus on to get through it all. The game scales excellently, with our games of 2 and 4 players being equally enjoyable and through the careful balancing of action allocation of the tiles, I can imagine even with the full eight this game being a ton of fun and equally challenging. 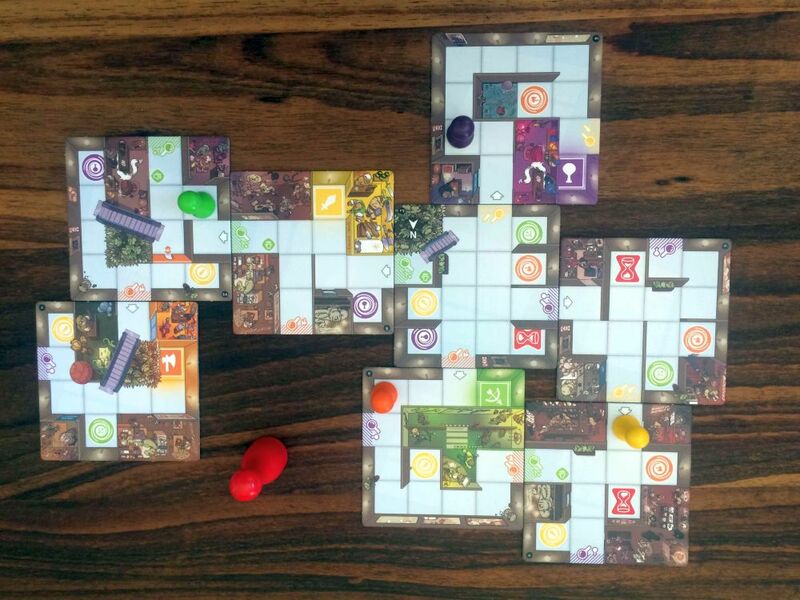 Solo was a little iffy as you’re drawing through tiles for the action you need to complete and it feels more like a Rubiks cube, some may enjoy the puzzle but it’s a cooperative game you WANT to play with others to share the moment of elation or failure. The theme is neither here nor there and I did feel possibly a dungeon delve could have been a better theme with the same mechanics, however it’s a weird and whimsical and family friendly theme choice. You’re getting a quality product of thick cardboard and nice pawns. The art could be a little more varied but the game is very much experiential as you wont have time to stare at art if you’re wanting to succeed in your heist. 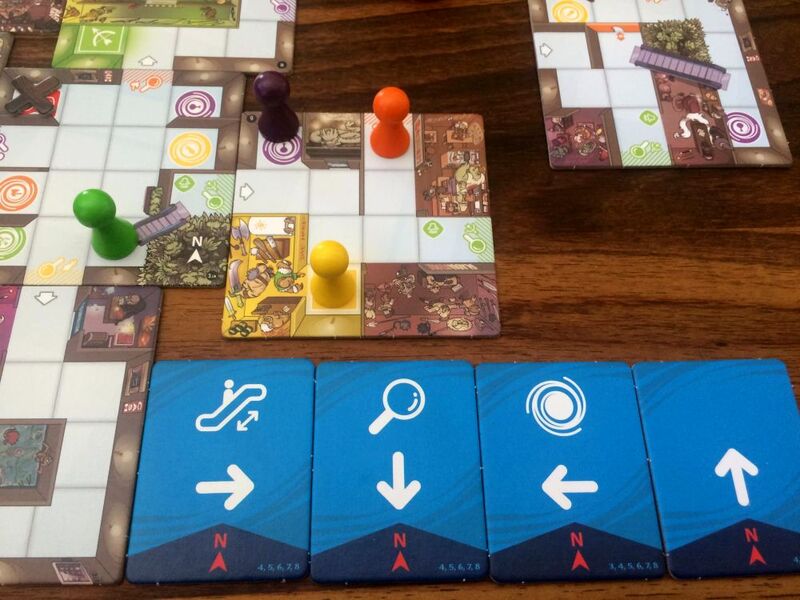 With tense gameplay, true cooperative problem solving and an evolving experience, Magic Maze is highly recommended for anyone who enjoys cooperative games. Easily taught in around 5 minutes and with an evolving level of difficulty, you could even find a middle level of complexity and keep playing that scenario without forcing you to make it harder. It’s an excellent choice to bring to newer players as well as a thoroughly enjoyable activity to play with your significant other or family. For those who struggle with tense quick paced action this may not be the one for you but for many gamers, this is definitely one you should add to your list with a lower price point than many others of its genre. 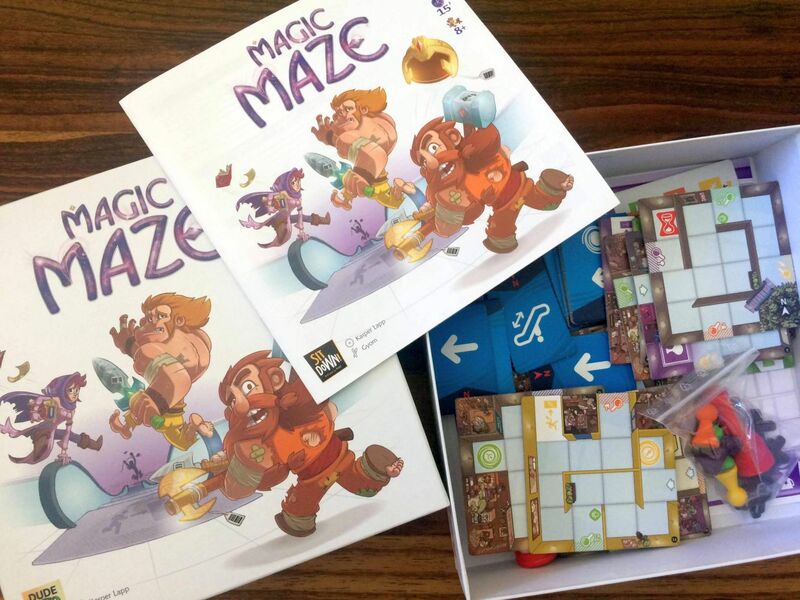 Magic Maze is my first real time cooperative game, and is therefore my favourite... Jokes aside I've never had an urge to play one before and the skill based group think puzzle that rewards repeated plays with the same group is exactly the game I'd want from this genre. It's got an excellent difficulty progression system, reasonable price point and a theme that wont turn off any players. Handling 1-8 players well and creating magical moment of synergy that be played as a filler or for an entire evening make this a great title for those who love cooperative challenging games that rely on your group, not a roll of a dice.